Challacolloite: Mineral information, data and localities. The K analogue of hephaistosite. Compare 'Unnamed (Potassium Lead Chloride)'. Uklonskovite 4 photos of Challacolloite associated with Uklonskovite on mindat.org. Pseudoboleite 3 photos of Challacolloite associated with Pseudoboleite on mindat.org. Cotunnite 3 photos of Challacolloite associated with Cotunnite on mindat.org. Nitratine 2 photos of Challacolloite associated with Nitratine on mindat.org. Bismuthinite 2 photos of Challacolloite associated with Bismuthinite on mindat.org. Hemimorphite 1 photo of Challacolloite associated with Hemimorphite on mindat.org. Galena 1 photo of Challacolloite associated with Galena on mindat.org. Pseudocotunnite 1 photo of Challacolloite associated with Pseudocotunnite on mindat.org. Cannizzarite 1 photo of Challacolloite associated with Cannizzarite on mindat.org. 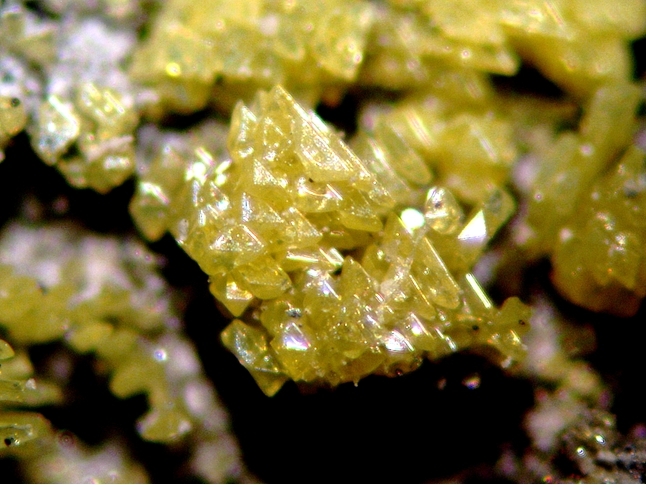 J. Schlüter, D. Pohl and S. Britvin (2005): The new mineral challacolloite, KPb2Cl5, the natural occurrence of a technically known laser material. N. Jb. Min. Abh. 182, 95-101. Mitolo D., Pinto D., Garavelli A., Bindi L. & Vurro F. (2009): The role of the minor substitutions in the crystal structure of natural challacolloite, KPb2Cl5, and hephaistosite, TlPb2Cl5, from Vulcano (Aeolian Archipelago, Italy). 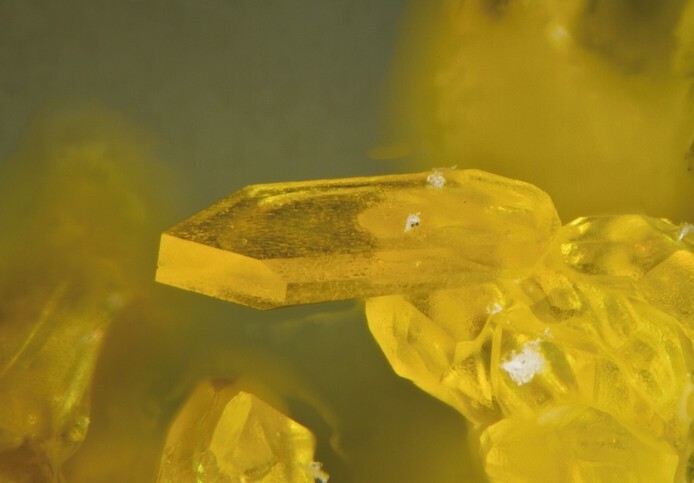 Mineralogy and Petrology 96, 121-128. The following Challacolloite specimens are currently listed for sale on minfind.com. Africano, F., Van Rompaey, G., Bernard, A., Le Guern, F. (2002): Deposition of trace elements from high-temperature gases of Satsuma-Iwojima volcano. Earth, Planets and Space, 54, 275-286. F. Africano, G. Van Rompaey, A. Bernard, F. Le Guern (2002) Deposition of trace elements from high temperature gases of Satsuma-Iwojima volcano. Earth Planets Space 54, 275-286. Pekov, I.V., Zubkova, N.V., Pautov, L.A., Yapaskurt, V.O., Chukanov, N.V., Lykova, I.S., Britvin, S.N., Sidorov, E.G. and Pushcharovsky, D.Y. 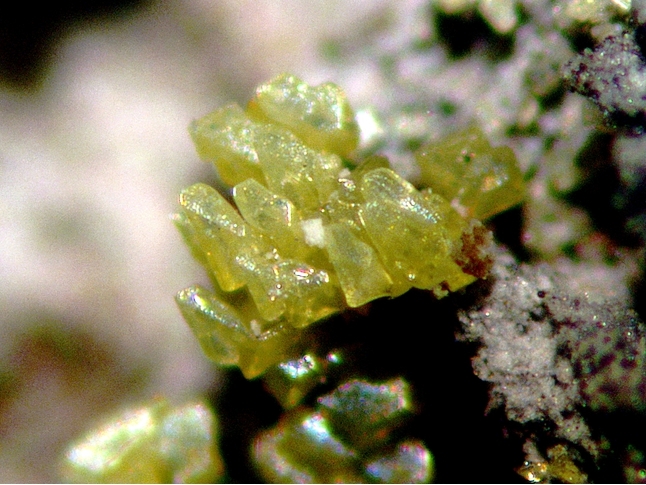 (2015): Chubarovite,KZn2(BO3)Cl2, a new mineral species from the Tolbachik volcano, Kamchatka, Russia. Canadian Mineralogist. 53: 273-284. • Tkachenko, S.I., Porter, R.P., Khorzhinskii, M.A., Van Bergen, M.D., Shmulovich, K.I., Shteinberg, G.S. (1999): Ore and mineral formation from high-temperature fumarole gases at Kudryavyi volcano, Iturup island, Kuril Islands. Geokhimika, 4, 410-422.